Casse and I took a fall photo drive this year beginning in the Salt Lake City area. Northern Utah, which is known for it’s “reds” seemed to be a bit off this year. 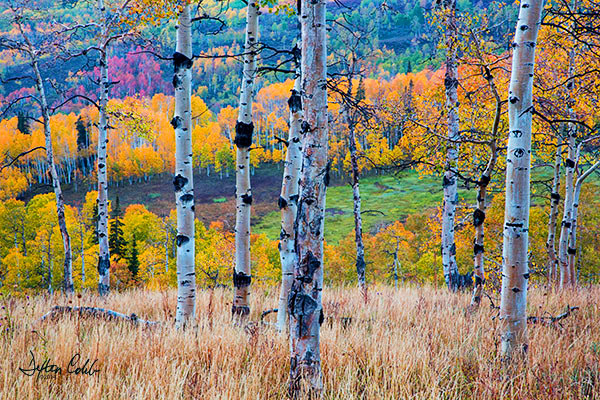 The reds didn’t develop and the aspens seemed a rather dull shade of yellow. So we left the area earlier than planned and headed toward Southwestern Colorado. So on a rainy late September morning while en route to Durango from Salt Lake City we took a leisurely detour through the Manti-La Sal National Forest. Somewhat surprised at the beauty of the general area, the plan was simply to get a shot of Electric Lake from an elevated site. This proved to be a bust after a wrong turn. But there was so much more to see that our little detour was extended a bit. We found ourselves on Skyline Drive; rainy, muddy and beautiful. Apparently a huntsman’s paradise too since we only encountered hunters, no other photographers. I like the simplicity of this image with its wonderful background.